Director – John Erick Dowdle, Screenplay – Brian Nelson, Story – M. Night Shyamalan, Producers – Sam Mercer & M. Night Shyamalan, Photography – Tak Fujimoto, Music – Fernando Velazquez, Visual Effects – Custom Film Effects (Supervisor – Mark Dornfeld) & Zoic Studios (Supervisor – Rocco Passionino), Makeup Effects – Almost Human Inc (Supervisor – Robert Hall), Production Design – Martin Whist. Production Company – Media Rights Capital/The Night Chronicles. Five people get into the elevator in a Philadelphia high-rise – a Gulf War veteran, a middle-aged woman, a younger woman, a mattress salesman and a security guard delivering a package to one of the floors. However, the elevator stops midway up. Security and maintenance attempt to work out what the problem is. As the five wait for help to arrive, the power starts to flicker off and on. When the lights come back on after one of power cuts, the young woman finds she has been gouged in the back. The group accuse one another of having done it. At the same time, police detective Bowden and his partner come to the building, investigating a body that has fallen from one of the top stories. Bowden becomes involved with the situation as another power cut occurs and one of the five in the elevator is killed. As others in the group are killed, Bowden tries to trace the identities of each of the five, soon finding that all of them have dark or criminal pasts and that each has a potential reason to be killed or the killer. At the same time, one of the security guards believes that what is in the elevator is The Devil who is disguised as one of the five and has come to torture the guilty before claiming their souls. Soon the nature of events begins to convince Bowden that this may be the case. Devil – or to give it the full title that appears on the screen The Night Chronicles 1: Devil – is the first in a proposed series of films conceived by director M. Night Shyamalan, which he has given to other directors and writers to make, he himself standing back in a producer capacity (although none of the other Night Chronicles have appeared so far). M. Night Shyamalan is of course the genre director who has made the likes of The Sixth Sense (1999), Unbreakable (2000), Signs (2002), The Village (2004), Lady in the Water (2006), The Happening (2008), The Last Airbender (2010), After Earth (2013), The Visit (2015), Split (2017) and Glass (2019). Shyamalan is an extremely variable talent. He was greeted with enormous acclaim after the left field ending of The Sixth Sense became a talking point that made the film into a major hit. This was sustained with variable effect throughout Shyamalan’s next few films but soon, by about the point of The Village and almost certainly by the time of Lady in the Water, Shyamalan’s shaggy dog twist endings became increasingly lamer, while the half-baked mysticism and the frequent accusations of big-headed egotism created a growing audience backlash. Shyamalan’s The Last Airbender, released two months before Devil, was greeted with some of the worst reviews of any film in recent memory. (I greeted The Last Airbender somewhat less negatively and suspect that much of the negative reception was due to audiences feeling ripped off by the shoddy post-production 3-D transfer that the studio had insisted on). Devil had the misfortune to go out into release when the bad smell of the public reaction to The Last Airbender was still in the air. I had the experience of sitting in a theatre when the trailer for Devil first appeared and hearing the audience give a loud cry of derision when the name of Shyamalan came up. The subsequent trailers for Devil discreetly went out with the Shyamalan name less prominently displayed. Certainly, when I went to see Devil, the normally busy opening day theatre was two-thirds empty and initial box-office reports were below expectation. Shyamalan has handed direction of Devil over to John Erick Dowdle. Dowdle, who usually directs while his brother Drew produces and often co-writes, first appeared with a couple of non-genre slice-of-twentysomething-lifestyle films Full Moon Rising (1996) and The Dry Spell (2005), before making the excellent serial killer Found Footage film The Poughkeepsie Tapes (2007). The Dowdles’ calling came with their mainstream breakthrough entry, the modestly effective Found Footage film Quarantine (2008) and subsequent to this a further Found Footage horror As Above So Below (2014), the non-genre action film No Escape (2015) and created/produced/directed the tv mini-series Waco (2018). While M. Night Shyamalan has conceived the story for Devil, the scripting duties are taken up by Brian Nelson who previously wrote for various tv series and the Michael Caine mini-series version of 20,000 Leagues Under the Sea (1997), before signing on with David Slade for both Hard Candy (2005) and 30 Days of Night (2007). Nelson went on to write the very strange Rupture (2016), as well as produce tv series such as DaVinci’s Demons (2013-5), 11.22.63 (2016), Altered Carbon (2018– ) and Nightflyers (2018). Devil comes with a novelty concept that immediately captures interest – the idea of a group of people trapped in an elevator with The Devil who is disguised as one of the party and is slowly slaughtering its way through their number. Devil also falls into the spate of what you might call Conceptual Economy Films that began in recent years with Phone Booth (2002), a psycho-thriller that trapped its protagonist inside a telephone booth for the duration. (Before that, you could trace the Conceptual Economy Film all the way back to Alfred Hitchcock’s Lifeboat (1944), a thriller that was set among a handful of survivors stranded at sea aboard a lifeboat). We have seen a number of other Conceptual Economy Films in the last few years – Vincenzo Natali’s Nothing (2003), which took place in a blank white void; Open Water (2003), which featured no sets, just two characters swimming in the sea surrounded by sharks; Black Water (2007), which took place in a tree; Wind Chill (2007), a ghost story that took place inside the front seat of a car; Shuttle (2008) with its protagonists held hostage in an airport shuttle; Buried (2010), which was set entirely around Ryan Reynolds inside a coffin; Frozen (2010) with three characters trapped in mid-air aboard a ski chairlift; 127 Hours (2010) with James Franco trapped in a crevasse; ATM (2012) with three people trapped in an ATM booth by a killer; Detour (2013) and Curve (2015) with characters trapped in SUVs; Locke (2014) that takes place entirely with Tom Hardy talking on a phone while driving; Landmine Goes Click (2015) with a character trapped standing on a landmine; The Shallows (2016) in which Blake Lively is stranded on a rock by the tide and menaced by a lurking shark; 200 Degrees (2017) in which Eric Balfour is trapped inside a heat kiln; and Serpent (2017) with a couple trapped in a tent with a deadly snake. All of that said, the work that Devil bears the closest resemblance to Elevated (1997), a 17-minute short film that was the directorial debut of Vincenzo Natali of Cube (1997), Cypher (2002), Nothing and Splice (2010) fame. 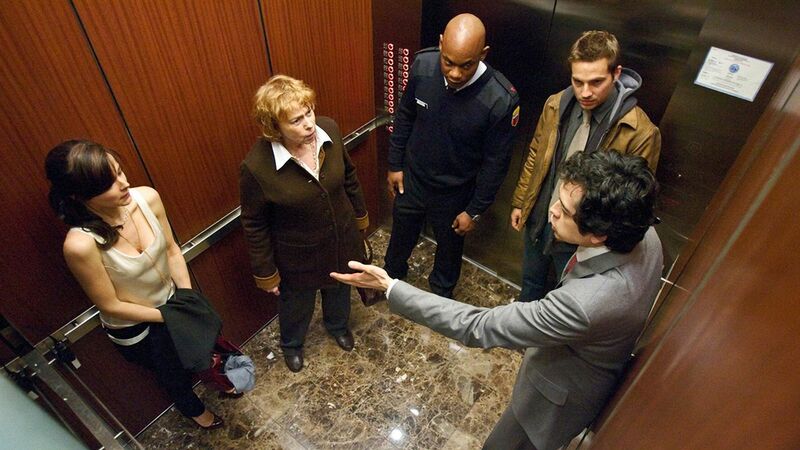 Elevated is almost identical to Devil in that it takes place with three people trapped together in an elevator – in this case in the midst of an alien invasion – where it gradually becomes apparent that one of the group is something not human. The good news is that by the very fact that M. Night Shyamalan has outsourced the writing and directing of Devil, it transcends many of his typical problems and becomes one of the better works to have come out under his name. 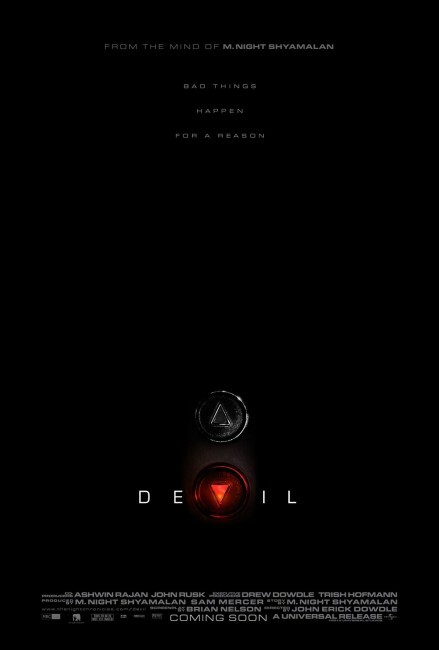 In fact, I would be happy to go so far as to say that Devil is the best film to come out with the Shyamalan name attached since The Sixth Sense. The majority of the film is contained within the elevator, although John Erick Dowdle breaks this up with several other concurrent happenings going on outside. Certainly, it would be a headache watching Devil if the entire film had taken place inside the elevator – because of the widescreen camera, most of these scenes emerge either shot with a slightly distorted fisheye lens or in closeup, or else from the single viewpoint of the security camera, which proves somewhat of a strain on the eye in a multiplex theatre. (Devil is a film that will work far more effectively on the small screen). Dowdle is also not afraid to engage in gimmicks like having the entire screen turn to black whenever the power goes out in the elevator and the result is a film that ratchets up a more than considerable degree of tension. Brian Nelson delivers a tight script. The bulk of the film essentially becomes a whodunnit between the various characters – albeit a supernatural whodunnit where we are constantly guessing which one of them is The Devil. The script does a clever juggle in managing to wind suspicion and motive onto each member of the group. That said [PLOT SPOILERS], the film does opt for some easily predictable options when it comes to its denouement – I successfully managed to foretell the identity of The Devil by betting on the option of the least likely individual and in guessing that it would not be one of the last two people left alive. There is a constant theme of and preoccupation with predestination running through M. Night Shyamalan’s films – where every character seems in the process of discovering their fated purpose and/or making a breakthrough in understanding to discover the true nature of the world and their part in it. More so than any other Shyamalan films (apart from his earlier two non-genre films before The Sixth Sense), Devil opts into a Christian worldview with the sense of everything being set up to judge the characters or allow them to find forgiveness for their sins. There is also the other regular Shyamalan theme of characters finding an eventual redemption from pain and loss in their lives – viz Bruce Willis in The Sixth Sense and Mel Gibson in Signs. In this respect, the film features a fine and sympathetically credible lead performance from Chris Messina. (Nominee for Best Original Screenplay at this site’s Best of 2010 Awards).